The Cruciform Library iSkills Blog highlights information and sessions offered by some of UCL Library Information Skills trainers over the academic year. There’s tips and advice on a range of topics; from Accessing Desktop@UCL Anywhere to writing a Biomedical Systematic Review. 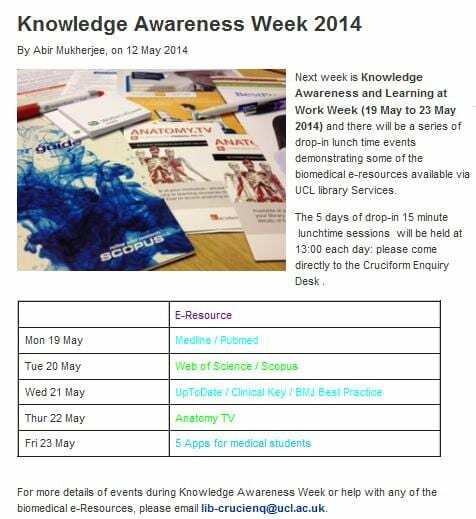 The latest post announces a series of 15 minute drop-in lunch time events for Knowledge Awareness Week 2014 next week, 19-24th of May, which should be useful for anyone needing to search biomedical resources for literature reviews later in the term. Why not pop in?